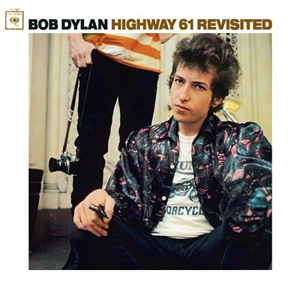 Highway 61, the main thoroughfare of the country blues, begins about where I began. I always felt like I'd started on it, always had been on it and could go anywhere, even down in to the deep Delta country. It was the same road, full of the same contradictions, the same one-horse towns, the same spiritual ancestors ... It was my place in the universe, always felt like it was in my blood. “It's like a ghost is writing a song like that. It gives you the song and it goes away, it goes away. You don't know what it means. Except the ghost picked me to write the song". The thing you might not already know is that Dylan is describing a real experience. It's not metaphor or a kind of artistic license - it's that only so much can be said without straining credulity. The idea behind this kind of inspiration is as old as the the Muses of the ancient Greeks and the design and construction of the Ark of the Covenant. And so it came to pass that in August 1963 a man with a bargain with the devil sang in support of the March on Washington for Jobs and Freedom - opening for the Reverend Martin Luther King's 'I Have A Dream' address, one of the finest moments in all of American history. There were many who might have been expected to have supported Dr. King that weren't present, but, as Dylan noted that day, those divisions had deep roots and had been carefully contrived. Bob Dylan, now a Nobel laureate, is 77 years old. Don't get involved in the occult - not because it doesn't work, but because it does. 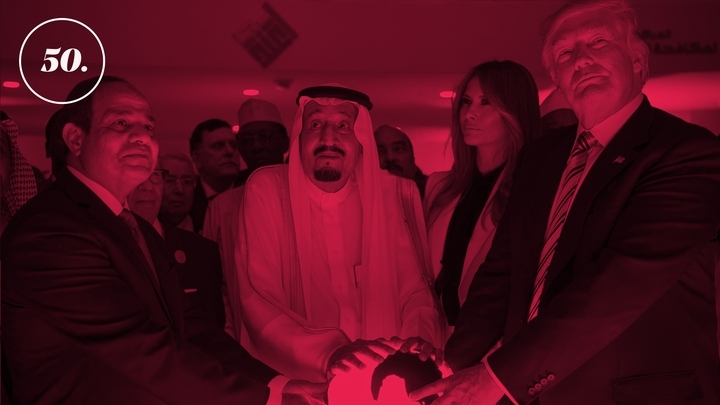 Above: Donald Trump touches the magic orb. To note the midpoint of the Trump presidency The Atlantic has prepared a list of fifty previously unthinkable stories about his time in office. Strange times for honest folks. Eighth generation soldier Tommy Clack served as a US Army captain during the Vietnam War. On 29 May 1969, Captain Clack was hit by an explosive shell in combat near Củ Chi, Saigon and was severely injured. Clack’s near death experience has a number of familiar elements: a feeling of calm and tranquility, viewing his body from above, a bright light and tunnel, meeting soldiers who had lost their lives; Clack witnessed his body being transported from the battlefield and the medical procedures that saved his life. When he regained consciousness ten days later, Clack was able to tell doctors and soldiers which of his comrades had not survived the battle. You’ve probably seen variations of the dying brain hypothesis – such as that recently offered by Dr Sam Parnia in the Herald – which proposes that your brain processes more about your surroundings when you’re clinically dead than when you’re asleep or unconscious. It’s an interesting theory – but it’s not easy to account for the unusual details present in so many NDEs of this type. I don’t think you understood what I wrote, or that you understand how things work in the real world, especially with drugs like these. Although I’m pleased that you now seem to understand what decriminalisation means, because that hasn’t always been evident. I'm not sure your take on the "real world" of drug use justifies the abolition of the Misuse of Drugs Act or the legalisation of recreational drugs. Rip it up and start again? Who knew that drug laws and health care could be so complicated. It’s not helpful to blur the distinction between the decriminalisation and legalisation of recreational drugs. Nandor was doing something similar a few weeks ago – it would be disappointing if that was part of a joint media strategy. If New Zealand relaxes its cannabis laws it will still need criminal sanctions that protect users from adulterated, mis-labelled and inherently dangerous drugs, including harmful analogs. It’s not practical to write regulations for the lawful supply of each and every substance some wanker wants to monetise. Lastly, this isn’t the first time you’ve downplayed the difference between the possession and supply of substances that can and do change lives. People who supply dangerous and addictive substances to vulnerable people (including young people) do a lot of harm and continue to deserve the stigma of society’s disapproval. 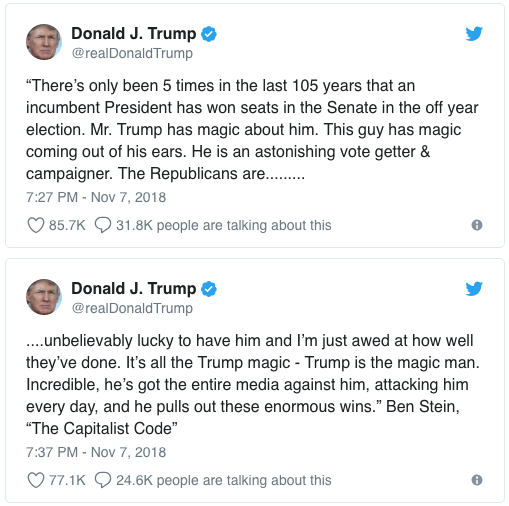 Ladies and gentlemen, I give you President Donald J. Trump, “magic man”. Magic is literally “coming out of his ears”. In other developments, Attorney General Jeff Sessions has resigned at Trump’s request. Sessions incurred Trump’s displeasure by recusing himself from Special Counsel Mueller’s investigation into Russian interference in the 2016 presidential election. Another inspiration for the song was the roommate of a girl I was seeing in the early 1970s. All things occult were popular in those days. Ouija boards, séances, palm reading, etc. A lot of the girls were into what was called “white witchcraft,” that is, they were practitioners of folk magic for benevolent purposes, as distinguished from malevolent witchcraft or black magic. I think some of them practiced a little of both. I thought it was charming and seductive, but I never took any of it seriously. The BBC says that Hotel California is played on American radio once every 11 minutes. Glenn Frey said that the song is based in part on the 1965 novel The Magus, Don Henley said it’s about American decadence. You can listen to the song for yourself and reach your own conclusions. Tragically, the disclaimer intro to Thriller was almost entirely overtaken by events. In 2003 Vanity Fair reported that Jackson had, among other things, taken actual blood baths and paid $150,000 to a voodoo chief in Mali to have 42 cows ritually sacrificed in order to put a curse on David Geffen, Steven Spielberg, and 23 others (see paras 2-4). Whether or not you think it’s a real phenomenon, people have been using witchcraft for a long time and there are things that pertain to it they are not going to tell you. 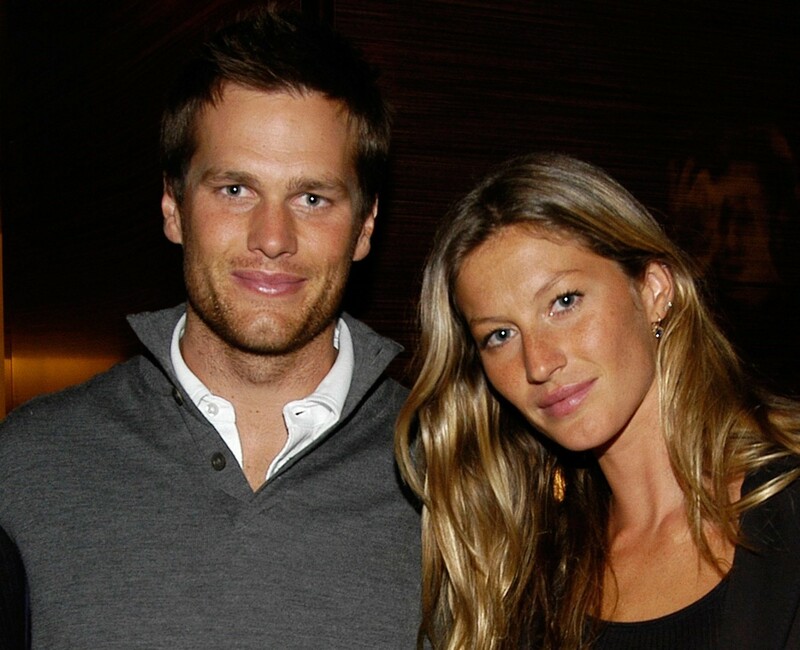 Read between the lines: don’t get involved in the occult.